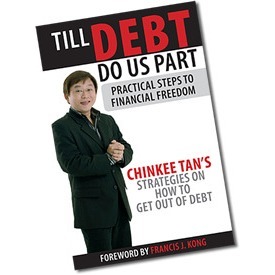 One of the books that created so much impact in my perspective in finances is Chinkee Tan’s “Till Debt Do Us Part”. Thank you for my officemate Gali Villaflor who shared this book to me. Here are some of my notes from this book. I advise that you get a copy for yourself as well. Principles are biblical and very practical, your 280 pesos investment in this book will go a long way. HAKUNA MATATA – No worries here. But we have to pray harder. Where worry ends, FAITH begins. What are the important things in life and the main things that make you happy? What do you need to thrive in life? What do you need to survive at a comfortable level? What do you have beyond these things needed for survival, comfort, happiness and thriving? What do you desire that goes beyond enough? If you don’t want to have more than enough. Can you work less? If you need less, could you be happy with enough and happier doing other things? DISCIPLINE, TIME and HARD WORK is a strategy plan of saving and investing. If you want to be a MILLIONAIRE, learn the value of savings and be willing to start small. If the budget does not permit it, sacrifice, save and wait for the right time to come. It’s not how much money you make, its how much money you save. What the Bible says about wealth?